NEW YORK — New York began picking up garbage yesterday for the first time since the blizzard a week ago, while on the West Coast a winter storm turned the main highway between Southern and Central California into a snowy, icy parking lot. New York City Mayor Michael Bloomberg said the next step will be figuring out what went wrong with the storm cleanup. Bloomberg was asked yesterday whether budget cuts had an impact on snow removal. The mayor said the city used the same number of workers as in previous storms. The Christmas weekend blizzard dumped 20 inches of snow on the city. Doherty said all the city’s 6,000 miles of streets have been plowed. About 1,100 garbage trucks began yesterday to collect 50,000 tons of trash that built up while workers were devoted to removing snow, he said. Cleanup costs from the storm totaled at least $20 million, out of a snow-removal budget of $38.8 million for this fiscal year, according to Sanitation Department figures. Also yesterday, New York authorities said a man who tried to jump to his death from his ninth floor apartment was saved by a heap of trash bags that had gone uncollected since the blizzard. Fire officials say the 26-year-old was taken to Bellevue Hospital in Manhattan shortly after noon Sunday. He was listed in critical but stable condition. In California, hundreds of motorists returning from the New Year’s holiday found themselves stuck after Interstate 5 was closed for a second day over the 4,160-foot-high Tejon Pass, about 70 miles north of Los Angeles. The California Highway Patrol closed a 30-mile section Sunday because of blowing snow. “It took us two hours to go five miles,’’ said Charlie Crandall, who was trying to return north after visiting relatives in San Diego. He and a friend were lucky enough to get hotel rooms nearby, but hundreds more didn’t get lodging, and cars kept coming. “A lot of people slept in their cars last night,’’ said Crandall, 55. 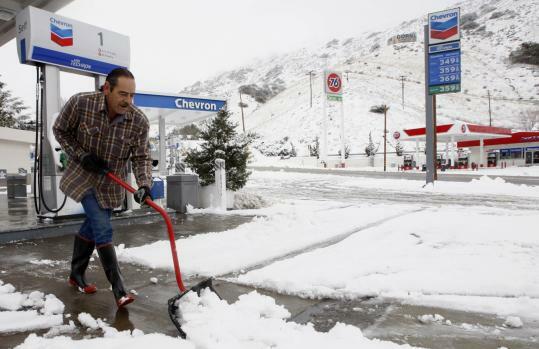 Other drivers spent hours crawling over Interstate 15’s snowy Cajon Pass to get back to Los Angeles from Las Vegas, where there was a trace of snow yesterday at the official measuring station near McCarran International Airport. National Weather Service meteorologist John Adair said up to 6 inches of snow fell overnight in Pahrump, about 60 miles west of Las Vegas. The weather service predicted more snow at elevations as low as 1,500 feet.